The deserted hospital ward following the incident. A YOUNG OFFENDER who presented at Beaumont Hospital caused serious damage to toilet facilities before escaping through a window last night. It is understood that the incident happened around midnight last night and that the young man was brought to the hospital as he said he was feeling unwell. He asked to use the bathroom when he arrived. The juvenile then started destroying the facilities in the toilet and escaped out the window. 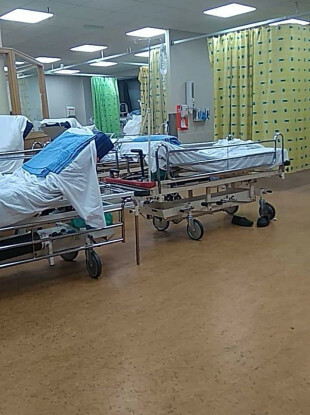 It is understood a number of emergency patients were told to attend the Mater Hospital as a result of the incident. Beaumont’s A&E department is back up and running as per usual. A woman attending Beaumont last night said the hospital was put on lockdown. She said: “I was attending Beaumont at the time of the incident last night. The whole A&E department was put on lockdown down and all patients were evacuated to the main waiting area. Email “'I had a glass window put in on top of me': Young offender armed with iron bar causes mayhem in Beaumont Hospital ”. Feedback on “'I had a glass window put in on top of me': Young offender armed with iron bar causes mayhem in Beaumont Hospital ”.